The incredible conclusion to the investigation into Jesus and Mary's bloodline which first began in Gardner's Bloodline of the Holy Grail. Now Gardner reveals centuries of previously inaccessible archives that show the truth about what became of Jesus and Mary Magdalene's offspring. Much has been written about the marriage of Jesus and Mary Magdalene, who Jesus was, whether he and Mary had children, and what became of them. The Grail Enigma is the first book that can answer those questions in amazingly accurate detail. Unique to any book on the subject, this contains full genealogical charts that trace the messianic offspring, historically named Tamar, Joshua and Joseph, and their lineage through 600 years through to Arthur Pendragon. Gardner's unrivalled access to Vatican archives reveal Christian manuscripts dating back to the 2nd century that document Mary as the 'bride of Christ' and Jesus's heirs who became very influential within the Roman Empire. In the years following the crucifixion they were hunted down. Four hundred years later, the New Testament gospels of Mathew, Mark and Luke were compiled removing all reference to the messianic marriage and bloodline, but the older gospels still document their legacy. Tracing the messianic line through 600 years since Jesus's crucifixion, Gardner explains how the fate of the messianic line became encoded in the Grail legend of King Arthur. The mythology of Arthur also reflected his messianic ancestor Jesus - in the messianic tradition, these `Once and Future Kings' both chosen to lead their people and prophesied to return again. 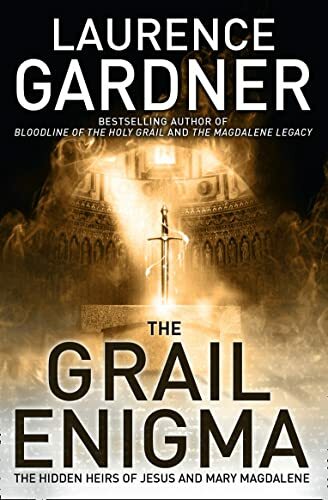 Using new and previously unpublished documentary archives, The Grail Enigma traces the detailed history of the descendants of Jesus and how the Roman Church sought to destroy their legacy and the most fundamental elements of the original Christian movement.